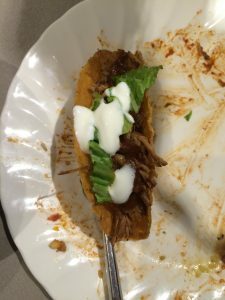 We were due to finish off the Mexican Chicken from the previous evening (see 17th March) and we didn’t have a suitable wine, apart from some decent off-dry Australian Rieslings, that we did not want to risk with this dish. We found a bottle of Blossom Hill Vineyard Collection in a 2 for £10 offer in Waitrose that looked like it might be OK. 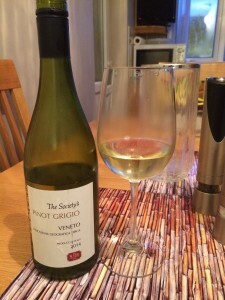 This is a non-vintage white blend from California described on the bottle as “Aromatic and Delicate” and categorised by Waitrose as medium dry. We tasted tropical fruits with a vanilla sweetness and found the wine very pleasant and easy-drinking. 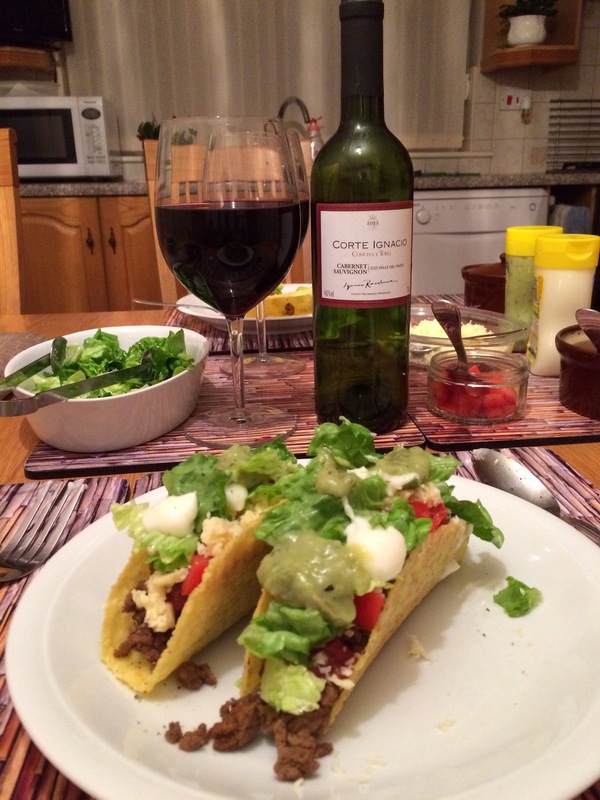 The same comments made yesterday on the matching challenges with the meal applied to this pairing. Overall though it was an acceptable match, but not quite as good as the Riesling tried previously. 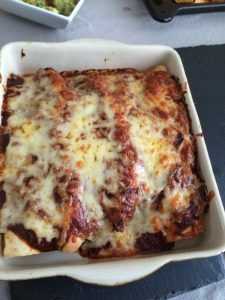 We fancied something a little different and spotted a Supercook recipe called Mexican Chicken with Fruits. This exotic chicken dish is baked in the oven in a sauce containing chicken stock, cinnamon, ginger, chilli powder and tomato puree. It is also covered with layers of bananas, oranges and pineapple, with brown sugar sprinkled on top. The meal was served with boiled rice. Dry wines were definitely out. We opened a bottle of Cono Sur Riesling Reserva 2010 from Tesco. This is a medium dry Chilean white and we tasted citrus fruits, particularly lemon with a nice tangy acidity that went well with the spices. 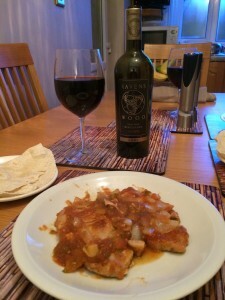 The wine went reasonably well with the chicken and the overall flavour of the sauce but did not have a particular affinity with the fruits themselves, where their sweetness detracted from the pairing. Not an easy dish to pair a wine with. 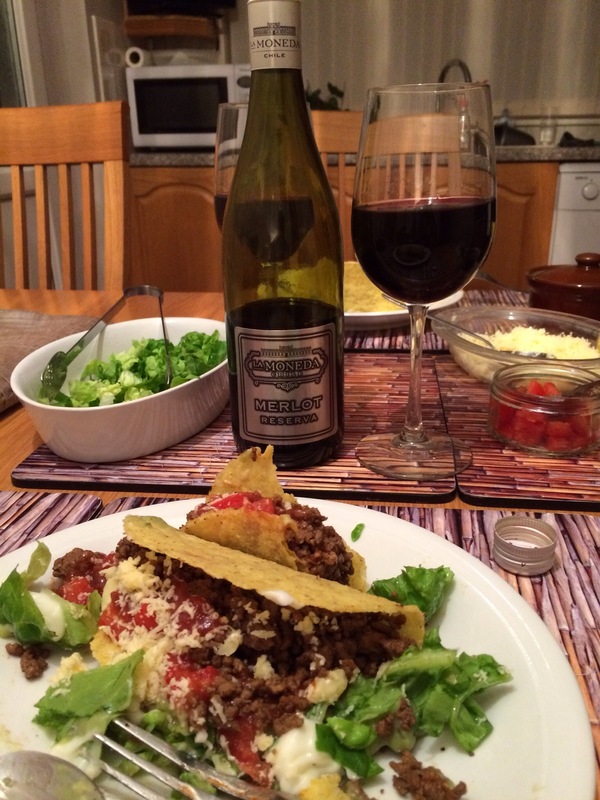 Tonight we had Chilli con Carne, a midweek favourite that we hadn’t had for a long time. 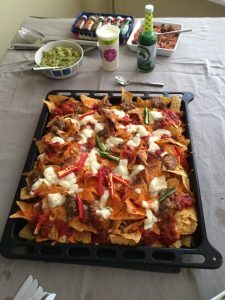 We have done this excellent recipe from the BBC Food website before, but Teresa tends to spice it up a bit, as is her wont. We opened a bottle of Finca el Cuento Syrah 2008 from Sunday Times Wine Club, a Spanish red we have tried on two previous occasions. 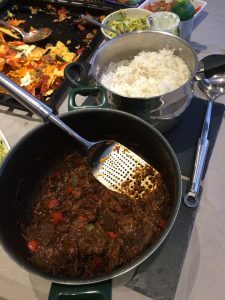 The first time we had it with Spaghetti Bolognese (see 1st June 2011) and subsequently with a spicy North Indian dish (see 26th August 2011). 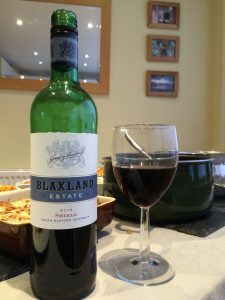 This medium-bodied wine went well with both those meals, but the spiciness in the wine was even better with the Chilli con Carne. The food also really brought out the cherry and black fruit flavours in the wine.